Equipment for hire to accurately measure and record the noise from neighbours or other noise nuisance that needs to be clearly identified. In order to take action on noise from neighbours, it is often necessary to positively identify the noise source. While it is important to measure the sound levels with an accurate sound level meter, those measurements alone are no use unless you can clearly identify the cause of the noise. The NNR-P-A1 has remote control unit. When the complainant hears the noise in question they press the button and the meter records the audio. The meter stores the statistical noise parameters continuously, but only records the audio on request. The Noise Nuisance Recorder consists of a Class 1 Sound Level Meter with detailed data logging and audio recording fitted inside a strong and lockable case. A microphone is connected to the outside of the case and mounted on a small tripod. The unit runs on an external power supply with battery backup in case of power loss. A Calibrator is included so that meter function can be checked before starting measurement. 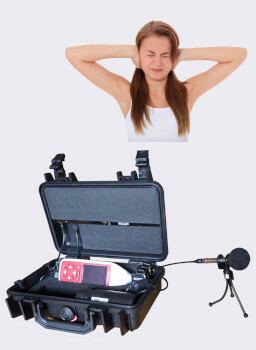 Although primarily intended for recording neighbour noise, the Noise Nuisance Recorder is useful for other noise sources, especially those of a sporadic nature. In addition to starting audio recording with a button push, the meter can also be set to automatically record when a preset level is exceeded. Carried in a simple bag, the equipment should not attract the attention of neighbours. Set the equipment up where the reported noise will be clearly heard. Plug in to the power outlet and switch on. Instruct complainant on the use of the remote control. After monitoring is complete, usually around one week, the sound level measurements and audio recordings can be downloaded to a computer for reporting and audio playback. The Sound Level Calibrator meets IEC 60942 Class 1 and ANSI S1.40:2006 Type 1. Dimensions 296 x 212 x 96 mm, 11.7" x 8.4" x 3.8"